pre-production approval has been received. If credit has not been established, payment will be required prior to production. Your order will be shipped 3-5 working (business) days after receipt of art approval. The following cri­teria must be met: “3-5 day Rush” must be clearly marked on order and is extended to credit-estab­lished (credit or credit-card approved) customers, unless the catalog indicates service is not available. Order and acceptable art must be received by 10:00 AM Pacific/1:00 PM Eastern time. If order is received after 10:00 AM Pacific/1:00 PM Eastern time, it will be considered received the following working day. RUSH orders should be e-mailed to: info@apspe­cialties.com. Art must meet requirements listed below or as listed on website: www.apspecialties.com. Art should be e-mailed to: art@apspecialties.com. For files over 5MB, please contact our office for instructions. Art must be received by 10:00 AM Pacific/1:00 PM East­ern time. Rush Service is subject to inventory, production avail­ability and credit-established customers. Orders will be shipped by regular ground service unless speci­fied on the order. Available on catalog items where indicated. 3-5 Day Rush Service is not available for embroidery, epoxy or any full color logos. Your order will be shipped the day after it is received. There are occasions when this may be necessary when your customer has not planned ahead or to meet emergency situations. The following criteria must be met: “24-Hour Rush” must be clearly marked on order and is extended to credit-established (cred­it or credit-card approved) customers, unless the catalog indicates service is not available. It will be shipped 1 working day after receipt of complete or­der and acceptable artwork. Order and acceptable art must be received by 10:00 AM Pacific/1:00 PM Eastern time. If order is received after 10:00 AM Pacific/1:00 PM Eastern time, it will be considered received the following working day. RUSH orders should be e-mailed to: info@apspecialties.com. For all 24-hour rush orders, only one-color, one-loca­tion imprint is available. Your request for this service - “24-Hour Special” or “24-Hour Rush” - constitutes your acceptance of the entire order without the ap­proval of a paper proof or pre-production sample. Rush Service is subject to inventory, production availability and credit-established customers. Orders will be shipped by regular ground service unless specified on the order. Available on catalog items where indicated. Vector art in Adobe Illustrator CC and lower, PDF or EPS format is acceptable. Art may be e-mailed to: art@apspecialties.com. For files over 5MB, please contact our office for instructions. Factory labor for additional artwork preparation time will be billed at $70.00/ hr. Customer will be notified if additional work is required. Unless exact sizing is requested, art will be reduced or enlarged to appropriate size. Our delivery schedule may depend on the quality of the artwork submitted. “No charge” for first paper proof. Subsequent revi­sions due to customer requests will be charged at $7.00 for each revision. $40.00 per color/position, plus cost of product and shipping costs. All set-up fees will be billed at time of product proof. • PMS color matches are available upon request. 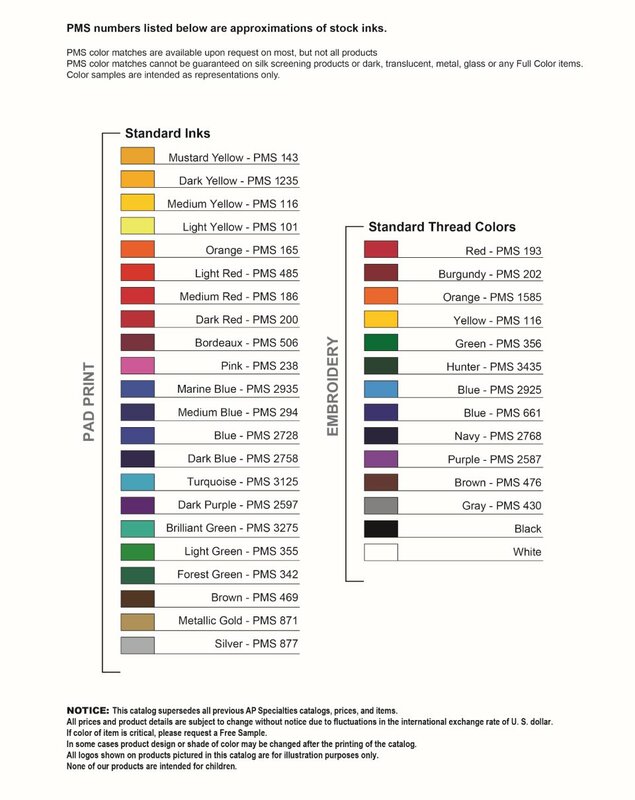 • PMS color matches are not available on screen printed items. • PMS color matches cannot be guaranteed on dark, metal, glass, translucent or any full color items. • Color samples are intended as representations only. 1-color, 1-location printing is included on most prod­ucts. Some products have other decoration methods. Set-up fees listed are for each color, location, and logo. Copy Changes will be charged $30.00 Set-Up per change. 2 to 4-color imprint on bottles available where indi­cated in catalog. For quantities over 500: $50 Set- Up Fee and Run Charge of $0.30.For quantities less than 500, $50 Set-Up Fee per color and Run Charge of $0.30. No Rush available for four-color imprint on bottles. Heat Transfer available where indicated in catalog. $50 Set-Up Fee per location. Run Charge for heat transfer up to 2 x 2: $0.99. Run Charge for heat transfer larger than 2 x 2 up to 6.5 x 3.375: $1.99. For heat transfers, larger than 6.5 x 3.375, call for quote. No Rush available for heat transfer. Full Color Emblem available where indicated in cat­alog. $50 Set-Up Fee per location. Run Charge for full color emblem: $1.99. Imprint area for circle em­blem: 1.5 D; Imprint area for hexagon emblem: 1.75 L x 0.75 H. Available colors: Reflective Grey, Silver, Gold, Blue, Black with Silver, Black with Gold, Red. No Rush available for full color emblem. If Laser engraving is included, the Set-Up Fee is $50.00. However, if the product states, “laser en­graving available”, there is a Set Up Fee of $50.00 and a Run Charge of $0.50 per item. For additional locations, there is a Set Up Fee of $50.00 and a Run Charge of $0.50 per item. $60.00 Set-up Fee for each location and an addi­tional run charge of $0.50 per item for each location, available where indicated in catalog. We make every effort to ship quantity ordered. How­ever, we reserve the right to ship up to 5% over or under runs. All random and/or blank sample requests are shipped via UPS ground unless otherwise stated on purchase order. Items over $10.00 are invoiced as a “30-day Memo Bill”. If the item is returned within the 30-day period, the invoice will be credited. Less than catalog minimum quantities are available on most items. Add $75.00 per item. Absolute mini­mum is 50% of catalog minimum. F.O.B. our factory in CA. Shipping will be best possi­ble way unless otherwise requested. AP Specialties is not responsible for delays or damages caused during shipping. Purchaser must file all claims with the carrier at the time of delivery. All shipping quotes are estimated and will be adjusted to final cost after order has shipped. Customer is required to accept and pay any additional freight charges. All packaging and shipping weights are approximate. They are subject to change without notice. Due to the volume of orders shipped daily, adjustments to ship methods MUST be received in writing (e-mail or fax) 2 days before scheduled ship date or changes cannot be guaranteed. Shipping methods on orders shipping early will not be adjusted to meet in-hands date without written request. All foreign shipments will be subject to a $25.00 handling fee per location, plus freight. All USPS ship­ments will be subject to a $10.00 handling fee per location, plus freight. Additional charges may apply for special packaging requests. Merchandise found to be incorrect due to AP Spe­cialties’ error or a defect in material or workmanship will be refunded or replaced at no cost if returned within 30 days of receipt of the merchandise. A writ­ten authorization including an RA number from AP Specialties is required prior to any returns or our re­ceiving department will not accept return shipment. Merchandise not imprinted will be subject to a re­stocking fee of 30% or $50.00, whichever is greater. Warranty not included on batteries or pen ink and refills after 30 days. Multiple shipments may increase additional handling and freight charges. To expedite your order, labels supplied for each location are preferred. For five or more drop shipment addresses, $8.00 will be added for each address. Additional charges may apply for special packaging requests. Cancellation charges will be determined by the costs that have been incurred at the time of cancellation. All confirming orders must be clearly marked as such. Factory will not be responsible for duplication of orders if “Confirmation” is not clearly marked on order. Upon approved credit, terms are 1% discount if paid within 10 days of invoicing or net/30 days. All oth­ers must submit pre-payment with order. Production scheduling will not begin until payment is received. Factory presumes clients are authorized to use trademark sent for production. We assume no liabili­ty in trademark and/or copyright disputes. The logos, insignias, designs and trademark printed on products shown in this catalog are reproduced only to show examples of our decorating capabilities. They are not presented for resale with these specific logos on them. They are not to be construed as product or brand name endorsements by or for the trademark owners. AP Specialties cannot be held responsible for failure to fulfill a delivery commitment as a result of situa­tions beyond our reasonable control. This includes, but is not limited to, occurrences such as: natural di­sasters (i.e. : hurricanes, floods), labor strikes, conges­tion at ports of entry, US customs/Homeland Security holds and delays, or failure of subcontractors to per­form. AP Specialties will provide written documenta­tion in support of any Force Majeure or commercial impracticability condition upon request. AP Specialties is committed to providing products that meet or exceed safety standards according to CPSIA, including, but not limited to, lead or cadmium content. Social compliance of suppliers is a priority when selecting products. California Proposition 65 requires a warning to con­sumers if a product may expose consumers to a wide variety of chemicals, including lead and cadmium. Prop 65 does not ban any product, it simply requires a warning to consumers. Prop 65 applies to all prod­ucts distributed in the state of California and only applies to California. The state of California requires significantly stricter standards to be met.